Explore Chicago’s North Side and South Side on this comprehensive guided city tour! See Chicago’s highlights and visit the impressive 360 Chicago (John Hancock Observatory) for magnificent views of the Windy City! Take a narrated coach tour with your expert guide through the South Side and travel through Grant Park, known as the ‘front lawn of the city.’ See Soldier Field, the Adler Planetarium with its massive sky dome.. Pass by the world's largest aquarium, the Shedd Aquarium, see the Field Museum of Natural History, and travel through the South Commons, a new 'close- in' residential community. You'll also get to pass by President Obama's old neighborhood and see where he used to live! On the North Side, travel by the striking Richard J Daley plaza with its acknowledged masterpiece, the Pablo Picasso sculpture, created exclusively for Chicago. Then, drive over the Chicago River and see the famous Wrigley Building and Wrigley Field. Soon you’ll see Chicago's elegant seven-level shopping complex and the renowned Water Tower Place, alongside one of the tallest buildings in the United States, the 360 Chicago (John Hancock Center). Here, you’ll get to de-board and enter this impressive building. 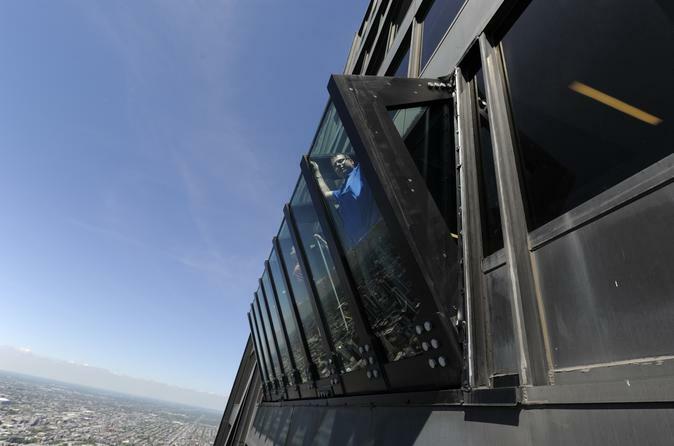 Hop into one of the world’s fastest elevators for a 39-second ride to the 94th floor of the 360 Chicago. On a clear day, you can see up to 80 miles away and view four states – Illinois, Indiana, Michigan and Wisconsin! Experience the open-air Skydeck, 1,000 feet above Chicago's Magnificent Mile, and admire the dynamic city below.